I was driving down a Busy Road. And ONE big Moose got in my way. Although I tried to brake and swerve. There’s ONE less Moose alive today! I was driving down the Interstate. And TWO large Deer got in my way. There’s TWO less Deer alive today! I was driving down a Thoroughfare. And THREE fat Geese got in my way. There’s THREE less Geese alive today! I was driving down a Boulevard. And FOUR Opossum got in my way. There’s FOUR less Opossum alive today! I was driving down an Avenue. And FIVE small Frogs got in my way. There’s FIVE less Frogs alive today! I was driving down a City Street. And SIX Pigeons got in my way. There’s SIX less Pigeons alive today! I was driving down a Two-Track Trail. And SEVEN Turtles got in my way. There’s SEVEN less Turtles alive today! I was driving down a Quiet Lane. And EIGHT Raccoons got in my way. There’s EIGHT less Raccoons alive today! I was driving down a Country Road. And NINE Turkeys got in my way. There’s NINE less Turkeys alive today! I was driving down a Rural Route. And TEN Coyotes got in my way. There’s TEN less Coyotes alive today! And ONE Moose… and TWO Deer… and THREE Geese… and FOUR Opossum… and FIVE Frogs… and SIX Pigeons… and SEVEN Turtles… and EIGHT Raccoons… and NINE Turkeys… and TEN Coyotes… got in my way! There’s ONE less Truck alive today! Reminds me of the Seinfeld episode when pigeons kept getting in George’s way. 🙂 Enjoyed. You should drive a garbage truck or a snow plow. My son drives a big-arse snow plow for the county. They don’t stop on a dime. It’s not pretty when a deer gets caught in the wing. British Columbia has a neat way of keeping the “livestock” off the roads in the mountains. Along the highways where the areas are heavily populated with deer, etc., it’s fenced and there are openings where the animals can get into the woods off the highways, but they can’t get back out onto the roads. Kind of like a turnstile. I thought it was very cool the way they did that. We don’t have that here in Ontario. I actually mostly drive a Ford Flex these days rather than my truck. 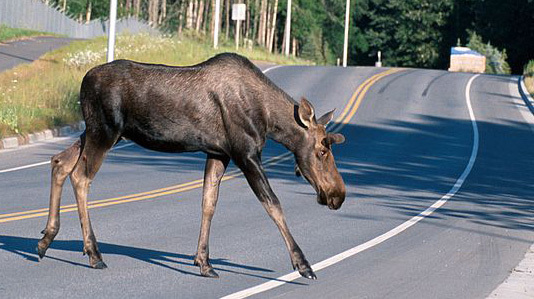 I have hit a moose before and lived to barely tell about it. Also, once a deer ran up alongside my car, clipped the side then vanished back into the woods. Maine is a crazy place. About the same here in MI, except the moose are only up in the U.P. so don’t have to worry about those. He he he – of the WP call lady! That there is a lot of roadkill stew, my friend! That’s what I was thinkin. That’s not the best Christmas song I’ve ever heard, but it’s not the worst. Very funny Mr B. R. C. You always cheer me up. Ha, never thought of the Christmas song angle!